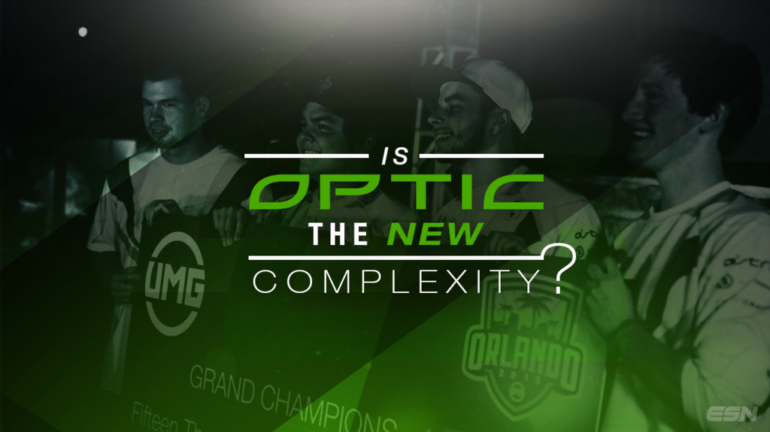 Could OpTic Gaming be the New CompLexity? OpTic Gaming is the most dominant team in the game right now. Could they become the next CompLexity? OpTic Gaming has been winning everything lately, and currently holds a 29-3 record in the MLG CoD League. After a second-place finish at MLG Columbus and bringing home the championship at UMG Orlando, OpTic has hit their stride. Early dominance on Advanced Warfare has propelled OpTic Gaming to the forefront of the competitive scene, which shows an eerie resemblance to another eSports organization that reigned dominant throughout the previous Call of Duty games, CompLexity. Complexity, consisting of Aches, TeePee, Crimsix, and Clayster, won six of the last seven tournaments in Black Ops II and were the dominant squad to close out the game. Although coL was playing extremely well at the end of Black Ops II, they knew they had the ability to grow even better with a slight alteration to their roster. After winning the first tournament in Call of Duty: Ghosts, there seemed to be no reason to make a roster change, but they thought they could still get better. With the release of Clayster and implementation of Karma into the roster, coL won their next four tournaments in Ghosts; including CoD Champs. The team chemistry and distinguished roles are what makes the new OpTic Gaming roster of Nadeshot, Scump, Formal, and Crimsix comparable to the most dominant team in CoD eSports history. The team works perfectly together and have mastered strategies necessary to be the best, just like coL did. What was so crucial to OpTic Gaming’s early success in Advanced Warfare was the roster change made by the organization at the time of release of the game. For the majority of Ghosts, OpTic Gaming’s roster consisted of Nadeshot, Scump, Clayster, and ProoFy. Despite bringing home the X Games Gold Medal for the Green Wall, OpTic was held to just that sole victory throughout the entire lifespan of Ghosts. With the new release of Advanced Warfare, the roster change was imminent and necessary. With the release of Clayster and ProoFy for Crimsix and Formal, the roster was set for OpTic Gaming with the perfect combination of slaying, objective work, and team chemistry. Formal’s stint with EnvyUs was short-lived as he could not pass up the opportunity to team with OpTic Gaming, and Crimsix was finished with the short-lived Evil Geniuses squad. When looking at statistics, it is clear how much more advantageous both Formal and Crimsix are to the OpTic Gaming roster than their predecessors. While leading the new OpTic Gaming to an astounding record of 25-3 in the MLG CoD League just halfway through the season, Formal recorded a K/D of 1.17 and Crimsix has stepped up as a vocal leader. Stats provided by CodCompStats. In addition to dominating online, OpTic Gaming has also shown steady improvements from their first LAN tournament to their second. Despite finishing second to FaZe at MLG Columbus, OpTic Gaming still had a solid event. Scump, Formal, and Crimsix successfully did their jobs as slayers while Nadeshot took an objective role. In the end, they failed to clutch up and started to make small mistakes that FaZe took advantage of. At the next event, UMG Orlando, OpTic Gaming continued to see improvements in their game. Formal improved from an overall K/D of 1.06 to 1.12. Crimsix played at the same dominant level and made the big plays when he needed to. Scump improved his K/D from 1.14 to an incredible 1.22. Nadeshot had the largest improvement of all, rising from a K/D of 0.83 to 0.94. The most staggering increase was the total K/D ratio of the team. After finishing with a 1.03 at MLG Columbus, OpTic was able to raise their kill-death ratio to 1.09 at UMG Orlando, en route to ultimately claiming victory. Many teams are scrambling and trying to come up with a roster that can compete with OpTic Gaming. With all of the constant changes, teams are actually hurting themselves and falling further behind as OpTic crawls further ahead in the standings of Pro Points and in the MLG CoD League. With the World Championships coming up in March, it looks like OpTic is going to run away with first place pretty easily. What do you think? Could OpTic Gaming go on to be the next CompLexity? Let us know by tweeting us at @eSportsNation.